Conscience-free chucker or transcendent scoring talent? The Milwaukee Bucks star can be both, and maybe more. For two seasons, Ellis played for the memory of former teammate Ronnie Gaylor. In August 1997, authorities alleged that Gaylor visited Kecia Brown at her home to collect an unpaid drug debt of $30. Brown told police that Gaylor attacked her when she refused to give him the money. Darlene Cheek, another woman in the house, grabbed a shotgun and fired at Gaylor, the bullet grazing him. Then Brown stabbed Gaylor three times in the chest with a kitchen knife, killing him. Ellis continued to play, leading the team to a championship in 1999, but his interest in basketball had begun to wane. College recruiters slowly began to evaporate. He stopped showing up for class. Something irrevocable had happened to Antwain. “We didn’t know what it was, but we could see it happening,” Billups says. Lanier’s ball boy during that championship season was Antwain’s younger brother, Monta. There’s a thin line between potential and prosperity. Monta seized his opportunity. Under different circumstances, Antwain might have done the same. But Antwain didn’t make it. Mississippi is rarely regarded as a basketball stronghold. “But if you talk to the right person, they know,” says Utah Jazz guard Mo Williams, a product of Jackson’s Murrah High School, who played against Antwain Ellis in high school. Mississippi hosts no professional teams, and the occasional Marshall Henderson notwithstanding, the states’ colleges are rarely competitive. But dig deeper and you’ll find a professional pipeline. Jonathan Bender from Picayune, Starkville’s Travis Outlaw, and Al Jefferson from Prentiss all declared for the NBA straight out of high school. From 1995 to 2005, only California produced more high schoolers drafted straight into the league with Illinois and Texas tying Mississippi with four. That exodus forced local colleges such as the University of Mississippi and Mississippi State to approach phenoms with caution. 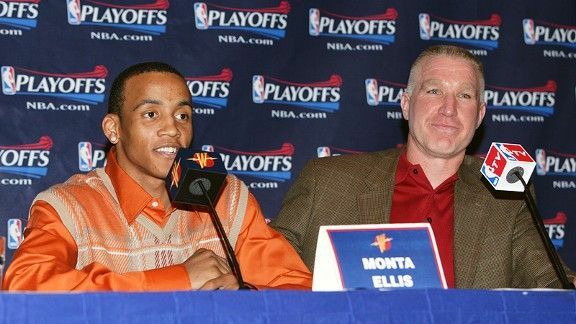 Monta Ellis was a local legend by the time of his recruitment. He began humbly with Operation Shoestring’s Project KIDS, an after-school program that taught him about basketball while building self-esteem. The nonprofit, designed to promote racial harmony, originated in 1968 in the basement of a Methodist church — eventually, it morphed into a safe haven for underprivileged kids from Jackson. Operation Shoestring renovated an antiquated furniture store into an after-school center and converted a warehouse into a basketball half court. With 9-foot ceilings, the rims reached just 7½ feet, but even in that compromised environment, Ellis stood out. Ellis always played above his age, with Antwain and his friends Mo Williams and Justin Reed, who played at Ole Miss and briefly in the NBA. “He was a dynamic player,” Williams says. “He was a special player. You saw that early on.” Billups, long familiar with the Ellis family, watched Monta during open-gym runs before his freshman year at Lanier. He decided at that moment to turn over the program’s reins to the younger Ellis. Early on, Broadus filmed Ellis’s games. Eventually, he had to stop. “I couldn’t keep up with him,” Broadus says. “The tape would be on one end and he would already be on the other end.” During one game, Ellis overheard a Greenwood High School coach telling his team that Ellis was just an ordinary player. Ellis had scored 15 points in the first half when the coach made his speech. We’ll see about that, he thought to himself. He finished the game with 65. Ellis finished with 72 points, the most in Lanier history. He scored 4,167 points in his high school career — shattering the state mark held by NBA veteran Othella Harrington. Ellis scored 42 points in a loss to an Oak Hill team that featured Josh Smith and Rajon Rondo, prompting Smith to hand over his tournament MVP trophy to Ellis. Ellis dropped another 46 points in a hyped matchup against South Gwinnett High School’s Louis Williams. Ellis verbally committed to Mississippi State in February 2004. A few months later, Sebastian Telfair declared for the 2004 NBA draft. It was a watershed moment. Before Telfair, Kobe Bryant and DeShawn Stevenson were the only guards to successfully make the transition from high school to the NBA. Bryant and Stevenson, who stood about 6-foot-5, flexed prototypical NBA bodies for a shooting guard. But Telfair was just 6 feet and looked like hundreds of other high school players, his outstanding athletic skill notwithstanding. The Trail Blazers selected Telfair with the 13th overall pick, igniting a significant shift in thinking regarding undersize high school guards. “We were in Denver, Colorado, for Team USA,” says Williams, a 6-foot-1 guard taken 45th in the 2005 draft after bypassing college. “We were watching the draft on television and when Sebastian got drafted 13th, I think all of our light bulbs went off: If he can do it, we can go pro, too. He’s small just like us. I think that was the moment when guys started preparing themselves to go into their senior year like, We think we can go pro. Ellis looked at him with cold, blank eyes. Cunningham had seen those eyes before. They were the same unforgiving eyes that made Cunningham want to recruit Ellis in the first place. Ellis flatly and firmly told Cunningham that he was already better than Paul. “That very second, I knew it was over,” Cunningham says. The Warriors selected Ellis in the second round, 40th overall, after knee surgery limited his workouts.3 Though he had fallen in the draft, he wasn’t dismayed. He only needed his foot in the NBA’s door, he told friends. It wasn’t long before teammates took note of his speed and athleticism. “His rookie year, we were in Hawaii for training camp and in the first four days of training camp, he was the best player on the court,” Baron Davis says. Mario Elie, a Warriors assistant, tried to make it clear to Ellis that he’d have to wait his turn. “I didn’t understand that no matter how good you think you are and what you can do for that team, you always have to wait your opportunity and just be ready for it,” Ellis says. So he bristled on the bench. Veterans like Calbert Cheaney and Derek Fisher tried to mentor Ellis. Cheaney invited him over for Thanksgiving that year, where Ellis bragged about his 72-point game. “There is no way you scored 72 points in one game,” Cheaney said to him. So Ellis went home and returned with a VHS recording of the game. That season, the Warriors made a trade with Indiana that transformed their team. Golden State acquired Al Harrington, Stephen Jackson, Sarunas Jasikevicius, and Josh Powell in exchange for Troy Murphy, Mike Dunleavy Jr., Ike Diogu, and Keith McLeod. The trade elevated Golden State’s athleticism, and Harrington and Jackson instantly clicked in Nelson’s offense. The Warriors finished the season on a 16-5 run, nudged their way into the playoffs, and made history in becoming just the second no. 8 seed to upset a top seed by dominating Dallas. Their team motto, “We believe,” became a mantra in the Bay Area. Despite the dissolution of that team, Ellis became a fan favorite. He followed his Most Improved Player Award in 2007 by averaging 20.2 points in the 2007-08 season.7 But then, just as everything was coming into focus, he put his career in peril. While riding a moped back home in Jackson in August 2008, he tore a ligament in his left ankle, just weeks after signing a contract worth $66 million over six years. Ellis originally told team executives that he sustained the injury while working out. He still seems conflicted about the incident. The injury, and the lie, led to an awkward, confrontational meeting between Ellis; his agent, Jeff Fried; Mullin; then Warriors owner Christopher Cohan; and Robert Rowell, team president at the time. Ellis, whose injury was caused by an activity that violated his player contract, apologized for lying and agreed to return just less than $3 million. The Warriors, Ellis says, wanted him to return $500,000 more. The meeting revealed a power struggle among Mullin, Nelson, and Rowell. “Chris Mullin made it perfectly clear to both Mr. Cohan and myself that he didn’t think this was a big deal at the beginning,” Rowell told reporters. “And we happen to think it’s a very big deal.” Ellis returned from the injury in January.8 He played slowly and tentatively at first, before putting it together in March. He scored 42 points in an overtime win against Sacramento in April. Familiar faces continued to fade. Mullin left the Warriors in May 2009 when the team declined to renew his contract. “I definitely have strong feelings about that situation,” Mullin says. “That’s looking at the whole situation. My support for him [after the injury] was the way to go.” Local newspapers reported that Rowell had taken offense that Mullin received most of the credit for acquiring the pieces of the “We Believe” team. The Warriors soon became Ellis’s team, but his ascension coincided with the team’s downfall. Fatherhood and marriage brought maturity, though Ellis seemed unsettled in other areas. He fumed about his teammates. Every year, media day became a spectacle. In 2009, Ellis announced at a media session that he and rookie Stephen Curry could not play in the same backcourt together. Ellis maintains that he was only being realistic about the situation. True or not, with the dissension that Ellis brewed, either he or Curry would have to be traded. 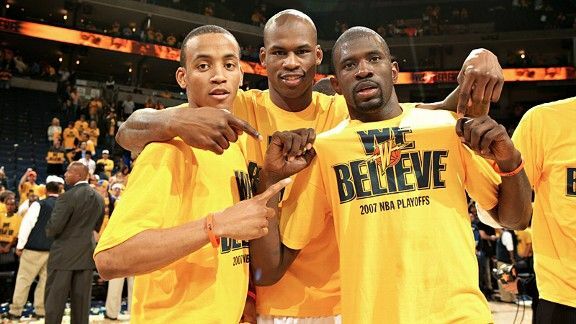 The Warriors ultimately chose Ellis, sending him, Kwame Brown, and Ekpe Udoh to the Milwaukee Bucks last season in exchange for Ellis’s old teammate Stephen Jackson and Andrew Bogut. Ellis says the trade caught him by surprise. He joined another small, speedy backcourt in pairing with Brandon Jennings.11 “I realized, I’ve just got to do what I’ve got to do,” Ellis says. “If I play the 2, I just got to play the 2.” Ellis averaged 17.6 points in 21 games with Milwaukee last season. The Bucks finished four games behind Philadelphia for the conference’s final playoff spot. Throughout his career, Ellis has been derided by proprietors of advanced stats, particularly in recent years. There is a cold quality to his game — all volume, little efficiency. When he’s on, he’s on. But when he’s off, the shots don’t stop. But he never doubts his ability, which is why he thinks that next midrange jumper will snap through the net, even if he’s missed his previous seven. “He has the ability to understand handling being the hero very humbly and being the goat if it doesn’t go well,” says Keith Smart, who coached Ellis in Golden State. This season, inefficient or not, Ellis has helped the Bucks qualify for the playoffs for the first time since 2010. (Unfortunately, the team’s first-round opponents are the 66-win Miami Heat.) After that, the Bucks will have a big decision to make about their backcourt. Ellis can opt out of his contract, and the $11 million he would make, to become a free agent this summer. The Bucks also have to navigate Jennings’s restricted free agency and the unrestricted free agency of newly acquired guard J.J. Redick. It’s unlikely that all three will return — head coach Jim Boylan is still determining how to divvy minutes to all three in the same backcourt. Too often, Antwain Ellis found himself surrounded by the wrong people. Monta knows his brother should have been in the NBA before him, paving the way just as he did at Lanier. Instead, in 2008 their mother, Rosa, found Antwain at his Jackson home with two gunshot wounds in his back. Police believe he had been shot elsewhere before staggering home. Miraculously, Antwain survived. And it seems to have changed something in him. 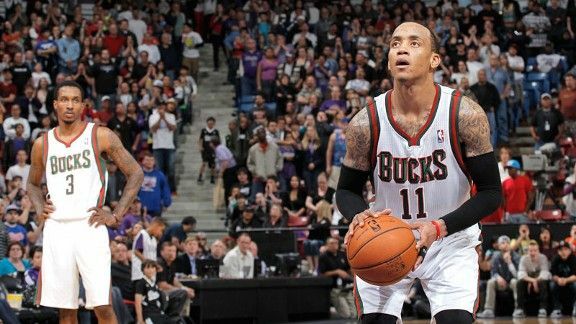 Monta Ellis is criticized for being a volume shooter, a feast-or-famine scorer, a gunner. But it takes a strong will to take the meaningful shot. He knows he’s blessed to be playing in the NBA — so he’s making (and taking) the most of it. He thinks about that every time he goes back home. “To this day,” Ellis says in his soft Southern drawl, “my grandma asks me, every time I go back home, how I made it out of here.” He doesn’t finish the thought, but we know the answer. Billups is Clippers point guard Chauncey’s uncle. Current Warriors executives, through a team spokesperson, declined to be interviewed about Ellis.